U.S. wind power capacity experienced growth of 39 percent last year but was not followed with green job growth as uncertainty about renewable energy policies and the global recession slowed overall production. The total installed capacity of new U.S. wind turbines accounted for more than 9,900 megawatts, which despite the recession is still the significant increase compared to 8,400 MW in the previous year. Total wind power capacity is currently more than 35,000 MW, which is according to the American Wind Energy Association enough to power 9.7 million U.S. homes. Total U.S. green jobs associated with wind energy sectors haven't increased in the last year due to the recession that took heavy toll on manufacturing, and have stalled at 85,000, which is almost the same number as in 2008. In 2008, wind energy job growth was significant with 35,000 new positions but recession prevented further growth in 2009. In order to add further boost to wind energy sector U.S. will have to convince European wind manufacturers to invest in the United States but Europeans want insurance for their investment in form of new renewable energy policies that should include long-term tax credits and a national mandate for renewable energy. 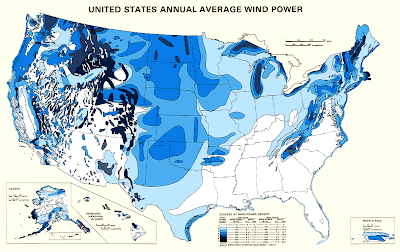 Wind energy definitely has great potential in US, and it's really no surprise that United States overtook Germany in 2008 as the world's top wind power generator. However China is approaching fast and could soon overtake U.S. in clean energy race mostly because China has already set national clean energy targets which are something U.S. still hasn't done. If U.S adopts national renewable electricity mandates investors would likely put more money into building transmission lines to carry more wind from the gusty center of the country to cities with high power demand, giving great boost to total U.S. wind energy sector.